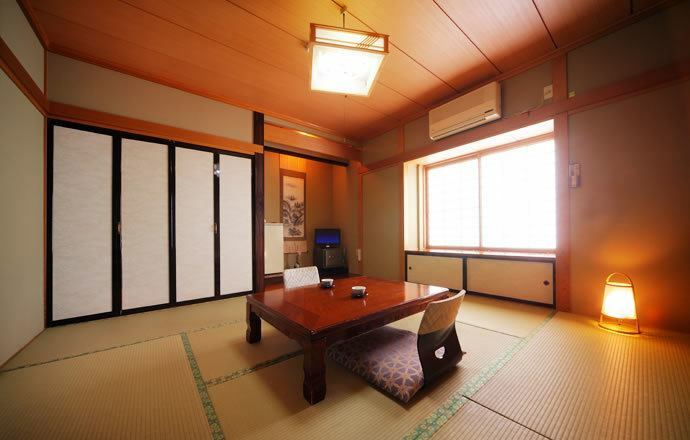 It is a two room type of Hori Kotatsu and a Japanese style room.Listen to the babbling of the river, leave yourself to the bath to your heart's content and relax your daily fatigue. 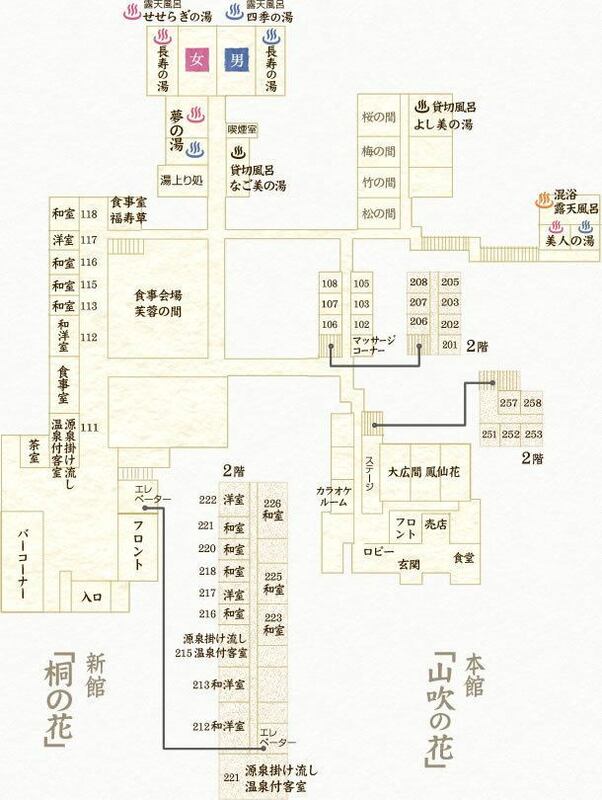 ※Please bring a towel / bath towel when going to a public bath. 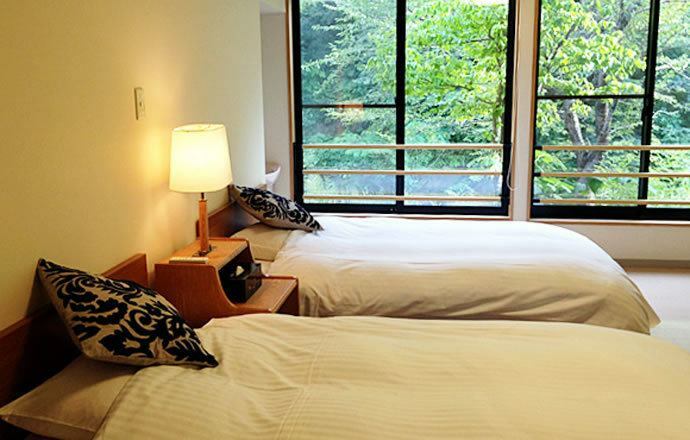 A 100% sprinkling Akakuchinashi with a bath with a bath "Akakuchinashi(Akakuchinashi)".It is a Japanese room and a twin bedroom, a Japanese room of digging kotatsu is made up of 3 rooms, making it the most spacious and spacious room at our hotel. The bath is a pottery bath, and if you open the window the view of the Semi Gorge spreads out soon.You can enjoy a hot spring with 100% source, with Semi Gorge naturally Semi Gorge up. A bath with a taste in a Japanese cypress bath A 100% sprinkling squirrel room with a bath "Apricot".It is a 2 room type with Western table and Japanese style table at the table.Please spend a relaxing time while watching the naturally rich location spreading under your eyes. 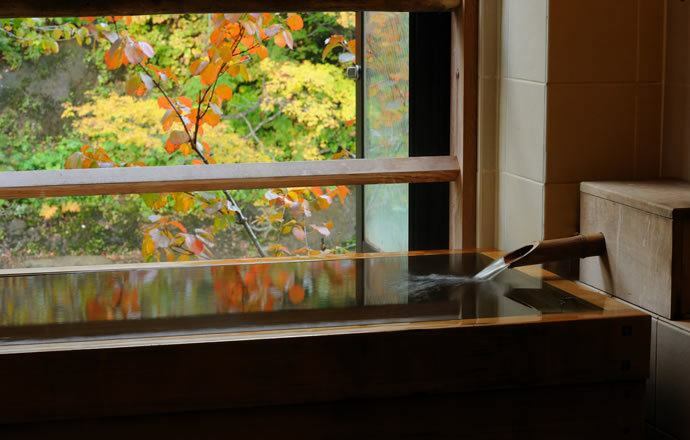 As well as a cypress bath, we use plenty of cypresses throughout the bath.The fresh aroma of hinoki is a reminiscent of both heart and body that is healed freshly.You can enjoy a hot spring with 100% source, with Semi Gorge naturally Semi Gorge up. 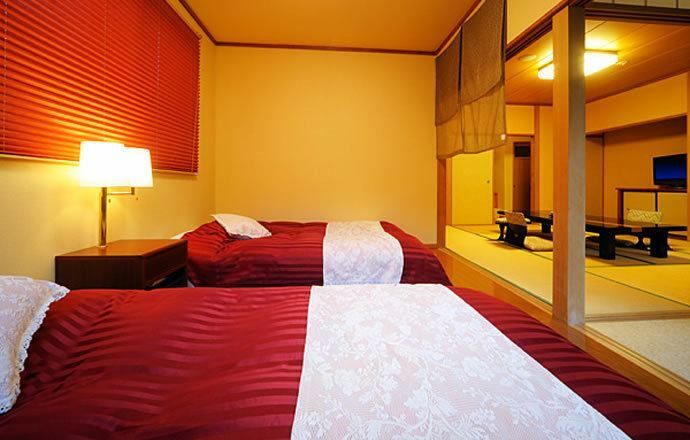 Japanese-style room·Western-style two-room type of Japanese + Western room "Shuka(Hanezu)".The bedroom is a bedroom full of cleanliness based on white.It faces Getogawa River and is surrounded by natural light. 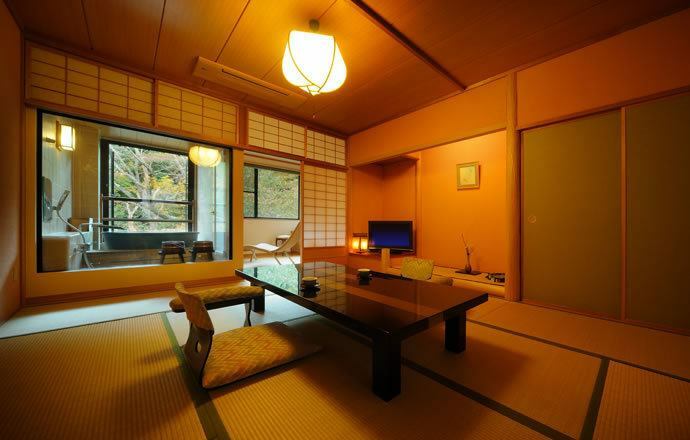 Japanese-style / Western-style two-room type Japanese + Western room "Hana Asagi".The bedroom is based on a restless asperial color.Secure a relaxing space on the wide edge, taking a break with a big deck chair.You can relax nature's music to BGM. 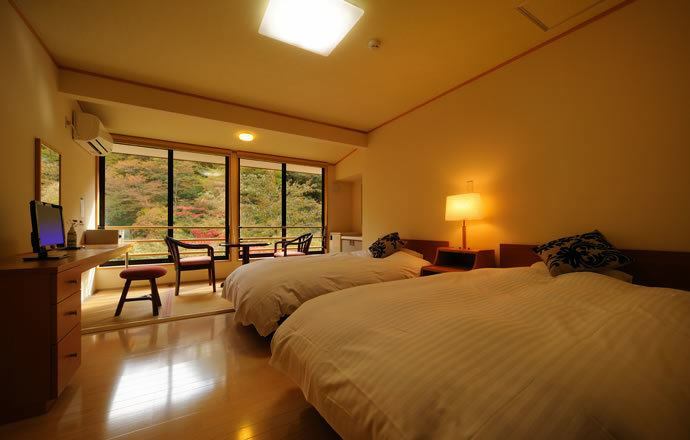 Japanese-style / Western-style two-room type Japanese + Western room "Rengyo".If you open the window, the scenery of the Semi Gorge spreads out soon.The bedroom is a bedroom full of cleanliness based on white. 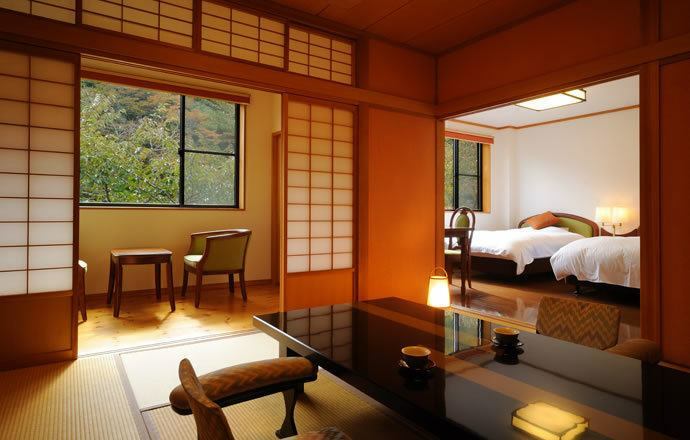 The traditional Japanese rooms with 14 rooms are elegantly furnished, the old-fashioned Japanese-style rooms (11 rooms) are the main. 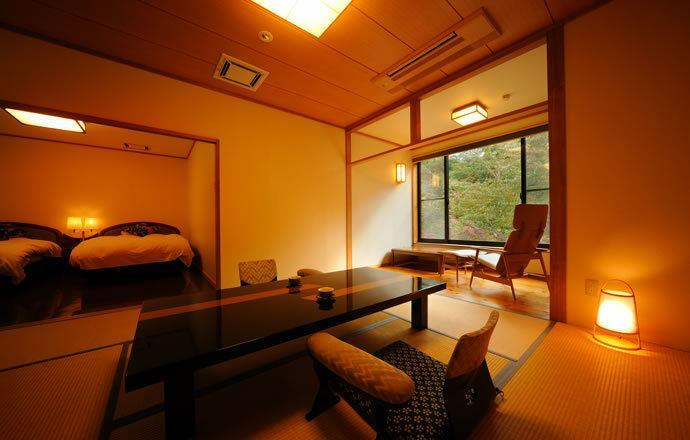 It is a Western-style room of modern type.Please spend relaxing in your favorite room. Spring, summer, autumn winter taste Enjoy a relaxing time at the mountainous inn. "Main building Japanese Kerria Flowers" crowded with day customers.A big side of Kitami's local entertainment Onikenbai will be greeted. 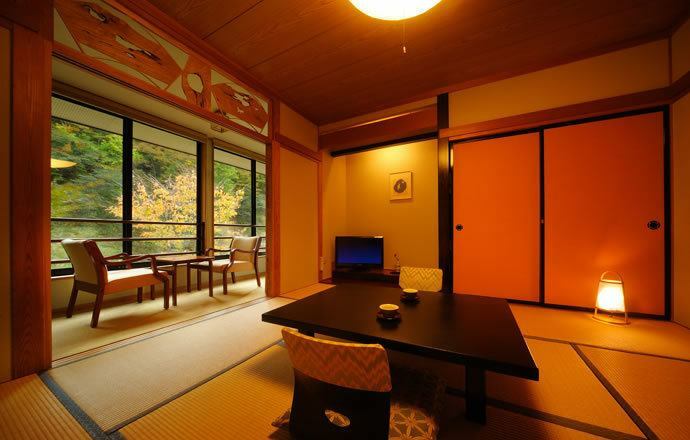 The rooms are Japanese-style rooms in all rooms.There are 16 rooms of 14 square meters and one room of 18 square meters.Accommodate 3 to 4 people in one room.Enjoy various summer seasons, various beautiful scenery, lodging in the mountains, spring summer autumn winter. Wireless LAN compatible throughout the building.